New for 2016, Thermacell's Max Life refills offer up to 12 uninterrupted hours of mosquito repellency. The Thermacell Mosquito Repeller system effectively repels mosquitoes, black flies, and other biting insects by creating a 15 x 15-foot zone of protection for bug-free comfort. 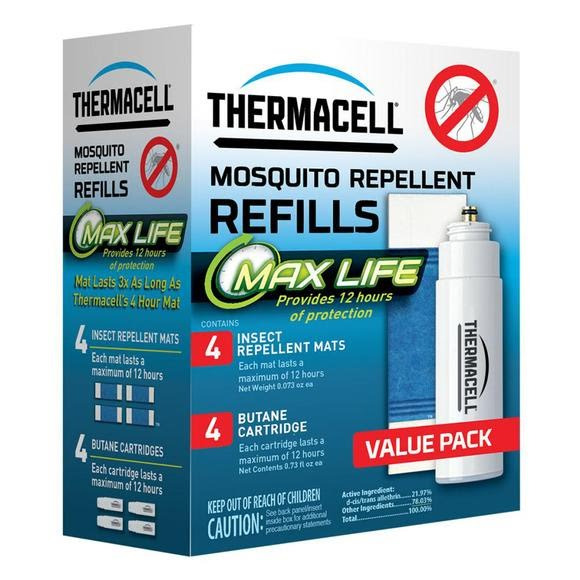 New for 2016, Thermacell&apos;s Max Life refills offer up to 12 uninterrupted hours of mosquito repellency. The Thermacell Mosquito Repeller system effectively repels mosquitoes, black flies, and other biting insects by creating a 15 x 15-foot zone of protection for bug-free comfort. Ideal for use while you are camping, hunting, fishing, gardening, and around the backyard, Thermacell products have been evaluated by the EPA for safety and effectiveness. All Thermacell Mosquito Repellers, Mosquito Repellent Lanterns, and Mosquito Repellent Torches work the same way and all are able to use any Thermacell repellent mats and refill cartridges. Thermacell repellent devices repel mosquitoes by creating a 15ft x 15ft zone of area repellent. This repellent, allethrin, is a synthetic copy of a natural repellent found in chrysanthemum plants. Thermacell repellent devices are powered by a butane cartridge. Butane provides the cordless, portable heat that activates the devices. The heat generated by the butane cartridge is directed to a metal grill. A small mat saturated with repellent is inserted on top of the metal grill. Heat disperses the repellent from the mat into the air, creating the zone of protection.